Sleep: Still doing pretty good! There was one night that I woke up about 4 times to go to the bathroom but other then that I may wake up once a night for indigestion and to use the restroom. Movement: She's definitely still getting her exercise in each day. :) Some times I think I feel hiccups but they seem so fast and are not lasting long. It's either that or this girl's got rhythm. Ha! Unglamorous body changes: Some days are better then others on the swelling. I'm still not really sure what's causing it. I've definitely started hitting my belly on things, using it as a shelf and I'm constantly dropping food on it. LoL. Other then that I can't really think of anything else. I feel like I really have been pretty lucky during this pregnancy as it has not been bad! What I miss: Energy. Still waiting for the nesting to kick in! I think my husband is nesting more then I am. Ha! Labor Signs: I decided to add this topic as we are getting closer to the end! I've been having several Braxton Hicks everyday, and I do feel like Maggie is definitely lower in my belly. My pelvic area has also been feeling sore and gets shooting sharp pains. I've also had some other signs that involve trips to the bathroom that is probably TMI for the blog. :) Also, I started taking Primrose Oil soft gels and drinking red raspberry leaf tea. Supposedly these things are supposed to help get your cervix ready for labor. Best moment this week: Ryan & I had a fun Saturday as we spent time with friends as a little last hurrah before Maggie makes her entrance. I went to a movie (Safe Haven) and then grabbed yogurt with my girls, and Ryan went to dinner, a comedy club, a video game place and casino with the guys. I also had two work showers this week!! (More to come on this later.) On Monday my work group threw Ryan & I a little shower and then on Friday Ryan's work group threw us a surprise shower! I really can't believe how blessed we've been. We also closed out our Amazon registry and plan to close out our Buy Buy Baby registry some time this week. I finally got the nursery and closet organized, and Ryan hung most of the decorations on the wall. Just a couple things left and it will be finished! Ryan also installed our borrowed car seat (ours won't be in until the end of April! ), and I started packing the hospital bag. Slowly but surely we are getting prepared! Looking forward to: Hanging the mobile and waiting for our Finger Print Tree print to get framed. Then I think I can officially call the nursery done. I never thought I would say that. Ha! I'll definitely be posting pictures when it's all done. And obviously getting really anxious for this little girl's arrival! I still can't wrap my head around the fact that our lives are so close to being forever changed. You look great!!!! I'm so excited for you- she will be here so soon! I never got the nesting instinct with either pregnancies. My husband and I kept waiting for me to get the urge to clean everything and it never happened- haha! Oh my goodness- you are so, so close! I can't wait to see the finished nursery! : ) It took me a while to figure out the hiccups thing, b/c they are so fast- but I think that's probably what they are since they're so rhythmic! 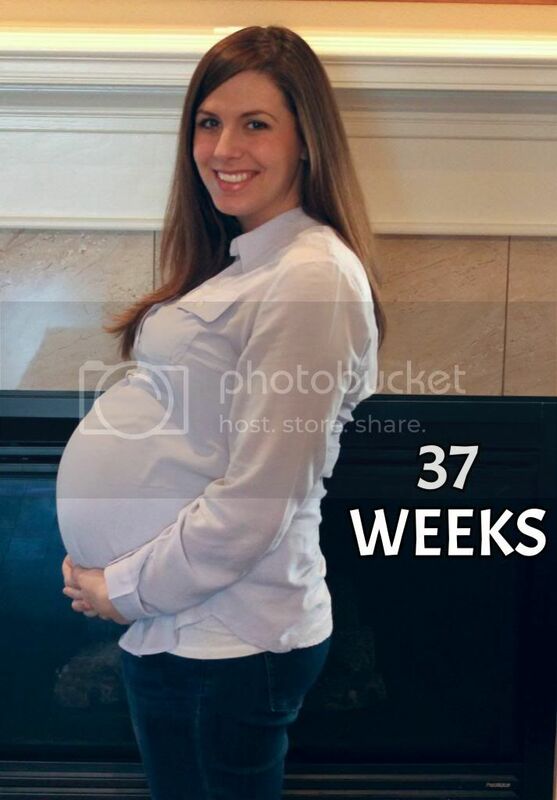 You look amazing for 37 weeks pregnant! Baby girls are just so fun and sweet, you will love it!